The sixth annual Safe Streets Summit was held this week in Miami, but right outside the venue was undeniable evidence of how little progress the region has made in greater Miami. Biscayne Boulevard, where the event is being held at the InterContinental Miami Hotel, is a nightmare for pedestrians. As wide as eight lanes in some locations, with as many as eight to nine blocks between crossings on some portions, it’s one of Miami’s most-dangerous arterials, advocates say. “We haven’t really made progress on the issue of safe streets here in any significant way,” Azhar Chougle, director of the advocacy group TransitAlliance Miami, told Streetsblog. In 2017, temporary projects added elements that improved pedestrian safety and the overall experience on Biscayne Boulevard. Some parking lots were turned into small parks, for example. Such interventions have been popular with the community, said the Alliance’s Marta Viciedo. Nevertheless, the responsible agencies — the Florida Department of Transportation and Miami-Dade County — have twice chosen to revert the street back to its dangerous status quo after successful pilots that improved the pedestrian experience. “Florida Department of Transportation is completely averse to anything that slows down car traffic to benefit pedestrian traffic,” Viciedo told Streetsblog. Last year, there were 32,000 injuries and 285 fatalities from car crashes in Miami-Dade county. Felipe Azenha, who lives nearby in Miami’s Belle Meade neighborhood, has been complaining about Biscayne Boulevard for a year. Just a few months ago, he was riding his bike with his 5-year-old son when they were clipped by a hit-and-run driver at a mid-block crossing. The flashing lights that were supposed to warn drivers of their presence had been — wait for it — hit by a driver and disabled. The TransitAlliance and its demonstrators are demanding improvements. They are asking for safer crossings, a protected bike lane, traffic calming and a dedicated bus lane. The street carries 22,000 bus rides a day, stretching through neighborhoods like Little Haiti on its way to downtown. In many places it also serves as a barrier to the waterfront. The City of Miami and the Downtown Development Authority are already studying a lane elimination plan for downtown portions of the road. The TransitAlliance says those proposals need to be expanded for the length of the read. FDOT is only half the story. As a one year resident of Miami, a big part of the issue is the authority Miami-Dade County has over municipalities. The county has complete control over traffic signals, stop signs, crosswalks, and pretty much all design changes from arterials to local streets. If a municipality wants to do something innovative for bike/peds and completely in line with best practices and AASHTO/NACTO standards, the design still needs to go through several layers of county review and may often be rejected based on arbitrary criteria or for not providing sufficient auto capacity. The photo of Biscayne Boulevard and the Green looks like pedestrians are pretty much stranded on one side of the split throughway or the other, with only a mad dash in making a crossing. I see motor vehicles got an elevated crossing though. I think you’re referring to the Metromover tracks? As far as I can see in the photo, that’s the only elevated travel method. Thank you, it looks more like roadway in that photo. Must be the Miami Vice lighting. 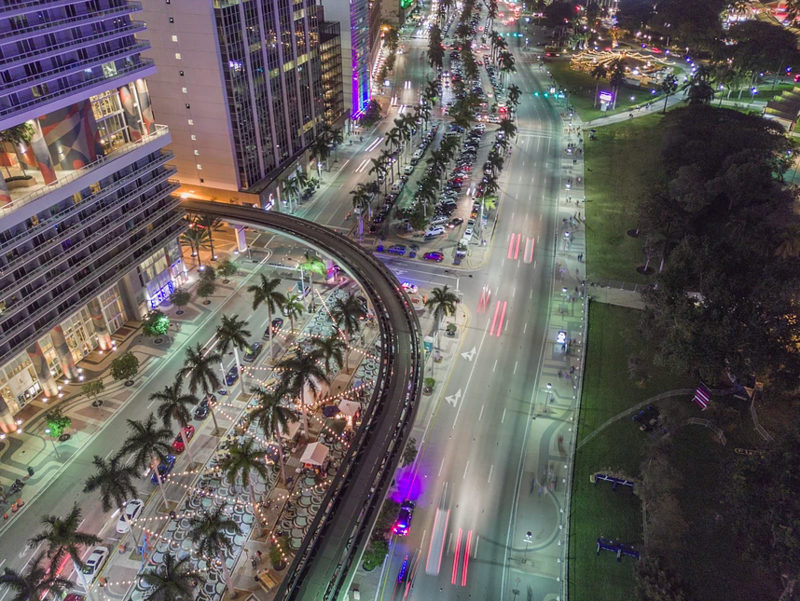 Miami's Biscayne Boulevard is eight roaring lanes of traffic cutting off downtown from the waterfront. But maybe not for long. In what could be a transformative project, the city is looking to convert this surface speedway into a walkable boulevard. It's an indictment of the approach to transportation planning that opts for pedestrian bridges instead of making streets safe for people to cross on foot.